1948 John Deere Tractor driven by Sam Zion, 1947 Binder being operated by Louis Zion. The 54th anniversary of the Threshing and Gas Show is this coming weekend and what an event it is. If you have never been to the event, it's truly a great time. They have many events, booths and many more things happening at the Herren Farm in Toledo. 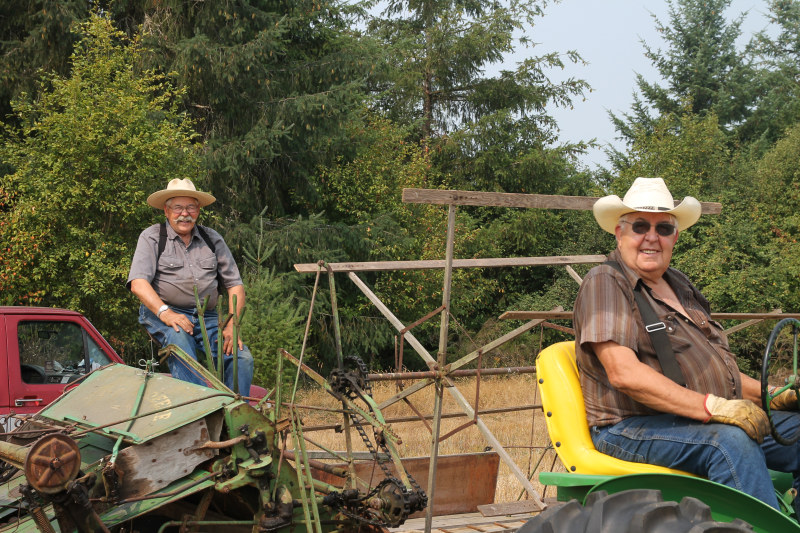 The evening starts with the Tractor Parade at 7:00 p.m. Friday night, the official opening of a great weekend to come. They will also offer a potato bar in the field from 6:00 p.m. - 9:00 p.m. for $8 per person. Saturday morning starts with Thresherman's breakfast at the Toledo Senior Center for pancakes, all you can eat for only $5. What a deal! At the FFA booth they will offer breakfast sandwiches for sale and then in the field Saturday and Sunday, the grange will offer biscuits and gravy for a reasonable fee. Normally, they start the threshing bee starts at around 11:00 a.m., they will have a little time to get things set up but it's hard to believe that this is how they cut grass so many years ago. The Model T expo is at noon both Saturday and Sunday. They will thresh each hour on the hour if you would like to see how labor intensive it was back in the days. Besides all of the above, they have a flea market, antique gas and diesel engines, rare steel wheeled tractors, restored antique farm machinery, stationary baler and antique cars and many more things to see. The big event always seems to be the tractor pull, trials start around 10:00 a.m. and continue from there. They usually start the full competition about 1:00 p.m. While you are hanging out at the Threshing Bee, you can hear live music all day from the Threshing Bee Band and of course eat at the barn where they have great food. They also offer free train rides all day, each day of the event. The cost to enter the threshing bee is the same $5 per person and children 12 and under get in free. So, it you haven't been, head on out to Jackson Hwy about 3.5 miles north of Toledo on the Robert and Ruth Herren Farm. Parking is free.. Hope to see you there, this is a must see event for all who live in the area. It's an event you will never forget!